On the way home from Miller Meadow last Sunday, I stopped to explore a very small portion of the Cook County Forest Preserves called White Eagle Woods, of all things. This is a name that would not bother anyone except a birder, in that there is no such thing as a White Eagle, but apparently it’s a common name that has been used for a lot of other things. Whatever the reason, White Eagle Woods is not far from my house, and also not far from the Des Plaines River, so it seemed worth checking out even in the middle of the day. There were not many species of birds present but there were a few cooperative individuals. 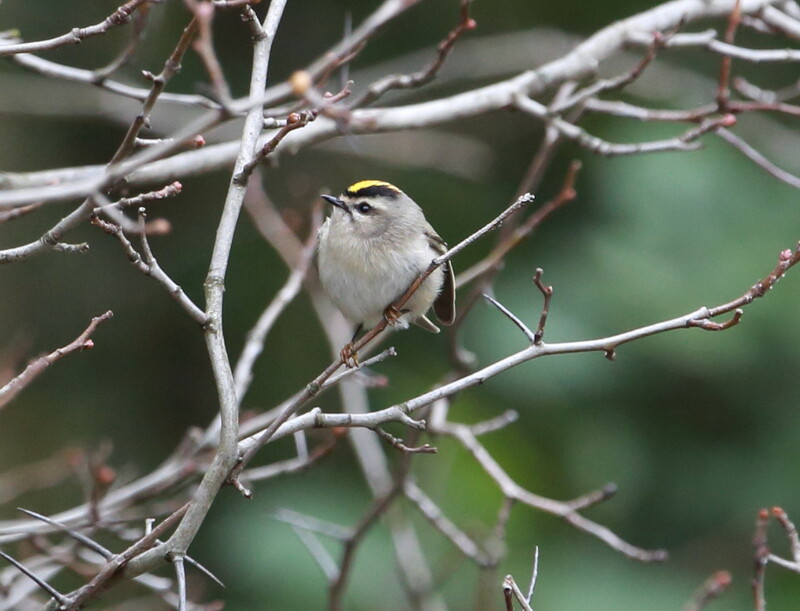 In particular there were a dozen or more kinglets, mainly Golden-Crowned but also a couple Ruby-Crowned Kinglets as well. The one Ruby-Crowned Kinglet who posed at the top of this post was not showing the feathers for which it is named. 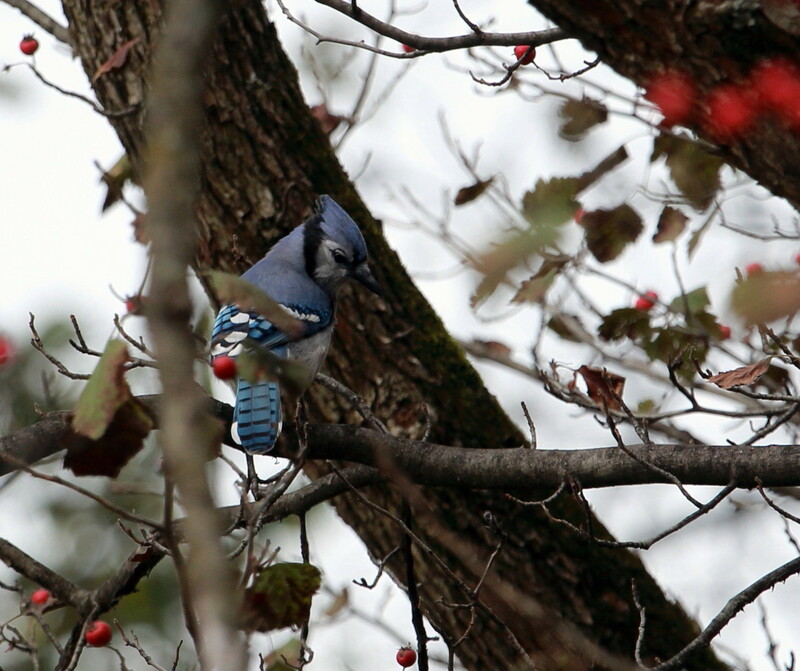 And for all the Blue Jays I have heard and caught glimpses of all year, none have been relaxed enough to let me take a picture until this one. For whatever reason he flew down to the curb, where he was at least unobstructed. 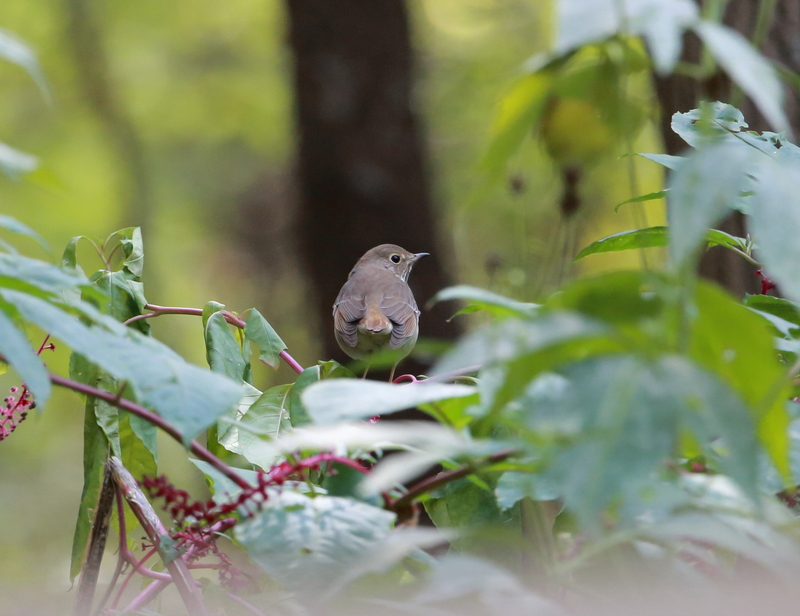 Also present on my short visit was a Hermit Thrush, which could not seem to decide whether to be seen or not. So although kinglets outnumbered all the other species at this location, the ubiquity of migrating Hermit Thrushes continues. 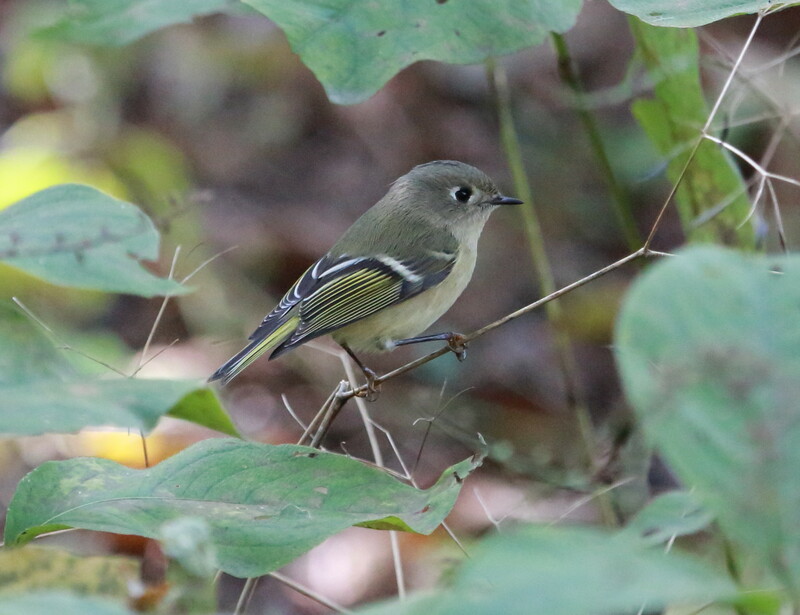 This entry was posted in birds, photography and tagged Blue Jay, Cook County Forest Preserves, fall migration, Golden-Crowned Kinglet, Hermit Thrush, Kinglets, Ruby-Crowned Kinglet, White Eagle Woods by Lisa Rest. Bookmark the permalink. I liked the blue jay a lot. There is something slightly improbable about it as though it had been painted by a cartoonist. 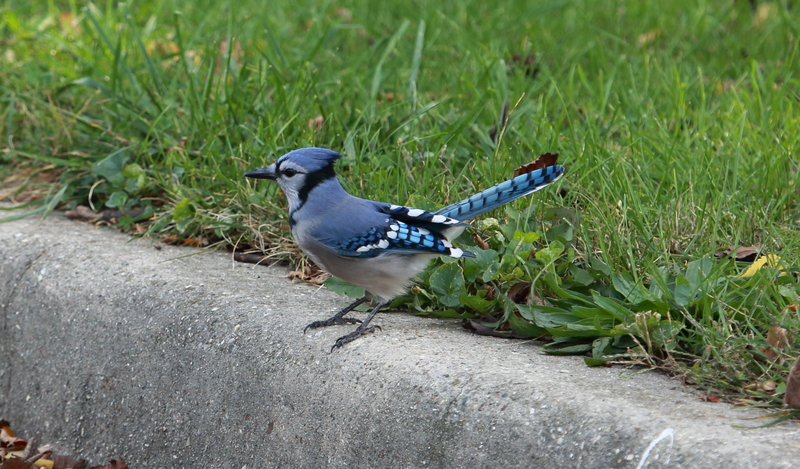 Very intuitive – you have characterized the Blue Jay persona perfectly. They often pose as sly tricksters – at least in their encounters with humans. So they would make perfect cartoon characters. I think we have had ruby crowned kinglets in the garden here, hunting for bugs among the serviceberry and other shrubs. I’m not positive that’s what they were, I thought they might possibly be vireos. Though I didn’t see them this year. Right now there are a couple of bluejays hanging around a lot, grabbing peanuts in the shell out of a feeder I’ve hung. It’s quite possible you’ve had Ruby-Crowneds in your yard and even missed seeing them on occasion. I’ve seen them just about everywhere – but they’re very small and they move very fast. More Golden-Crowneds this fall, it seems. A lot of them heard, like little tinkerbells. Yes, the first time I saw them I thought they might be hummingbirds – but they don’t hover.